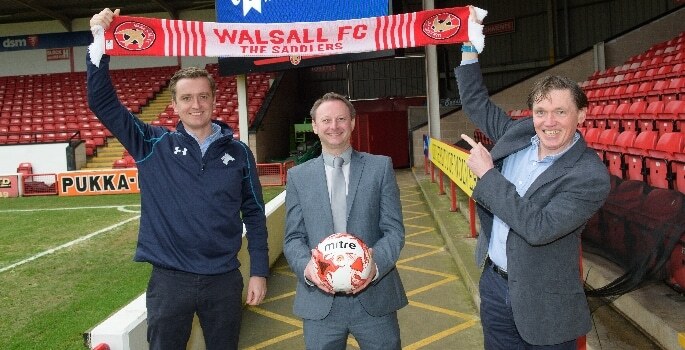 A new deal has extended the partnership between Walsall Football Club and the University of Wolverhampton until July 2020. The University will continue to sponsor the away stand, known as the University of Wolverhampton Stand, at the Banks’s Stadium. The sponsorship is part of a long running relationship between the University and the Saddlers. The University’s Institute of Sport and Human Sciences, which is based at its Walsall Campus, already works closely with the club providing fitness monitoring, sports science and psychology support to young players in its academy. The club’s academy Head of Sports Science, Desmond Duffus, is a graduate of the University having studied a Masters in Sports and Exercise. “We have a built up a great relationship with the club over many years and are pleased to be very much part of the Walsall community,” said Professor Ian Oakes, Deputy Vice-Chancellor of the University of Wolverhampton. Stefan Gamble, Chief Executive at Walsall, added: “We are delighted that our partnership with the University of Wolverhampton has been extended until 2020.